AMERICA/DOMINICAN REPUBLIC - Mgr. Peña Rodríguez denounces corruption in the judiciary: "Justice must go back and follow the right path"
Santo Domingo (Agenzia Fides) - The President of the Dominican Episcopal Conference (CED) described the Dominican justice system as "fragile", as the code-and-law enforcement officers are doing a job that leaves much to be desired. In the note sent to Fides, Mgr. Gregorio Nicanor Peña Rodríguez, Bishop of the Diocese of Nuestra Señora de la Altagracia en Higüey and President of CED, states that "people who have the responsibility to enforce laws do not understand what this service means, therefore they only take advantage of the benefits and take money". 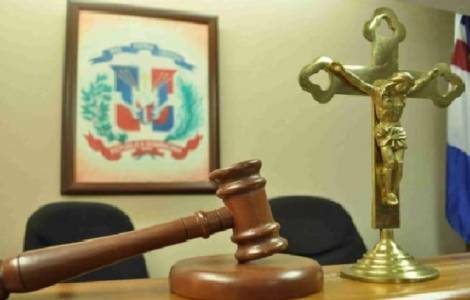 "That is why it is necessary for justice to follow the right path, because the Dominican justice is good and the rules are good, but those responsible for the application are not doing their job". The Bishop spoke in these terms during a brief interview with the press, questioned on the "Quirinito" case, namely the strange disappearance of a prisoner sentenced to 30 years in prison, Pedro Alejandro Castillo Paniagua (called Quirinito), for drug trafficking, and now disappeared into thin air. Mgr. Peña Rodríguez asked the Prosecutor General of the Republic "to resolve the case with all its consequences and to apply the law to all those involved, they all have to pay the consequences, no matter who they are".